Define the concept of Learning organisation ? What are the philosophy and characteristic of learning organisation ? 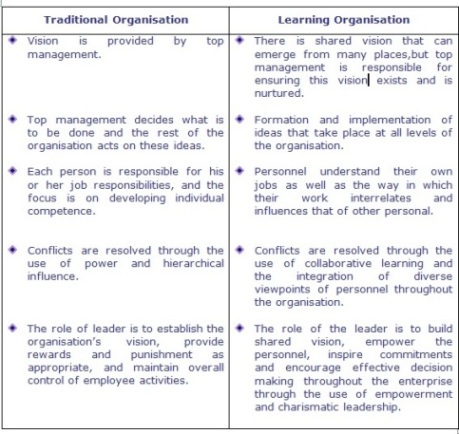 how it differ from traditional organisation ? how to develop a learning organisation ? A learning organisation is one that is successful at acquiring, cultivating, and applying knowledge that can be used to help it adapt to change. Learning organisations are skilled at experimenting with new approaches, learning from the experiences, and best practices of others. A learning organisation specifically tries to develop new skills; new knowledge, new cultural norms, and new insights. Moreover, one of its key characteristics is how an organisation can unlearn previous behaviours and develop new cognitive frameworks. Training, organisational behaviour management, and discipline are the three systematic approaches of learning organisation. It has Culture based on the notion that learning is central to success and effectiveness. Peter M. Senge in his book, “The Fifth Discipline: The Art and Practice of the Learning Organization”, described a learning organization “as a place where people continually expand their capacity to create results they truly desire, where new and expansive patterns of thinking are nurtured, where collective aspiration is set free and where people are continually learning how to learn”. David Garwin defines a learning organisation as "an organisation skilled at creating, acquiring, and transferring knowledge, and at modifying its behaviour to reflect new knowledge and insights." Ross, Smith, Roberts and Kleiner advocate this definition: "Learning in an organization means the continuous testing of experience, and the transformation of that experience into knowledge - accessible to the whole organization, and relevant to its core purpose". Meaning: Well-grounded definition of learning organisations; it must be actionable and easy to apply. Management: Clearer guidelines for practice, filled with operational advice rather than high aspirations. Measurement: Better tools for assessing an organisation's rate and level of learning to ensure that gains in fact have been made. If your transmission is acting funny, strange or weird and you suspect something is wrong you can bring it in and we at milwaukee transmission repair shop will perform a FREE diagnostics service on your transmission. Is an active philosophy; not merely an organisational system. Believes that its only competitive advantage is learning. Encourages people to learn to produce the results they desire. Nurtures creative and innovative patterns of collective learning. Develops fresh organisational capabilities all the time. ð Insisting on data rather than assumptions, as background for decision-making. ð Depending on simple statistical tools-to organise data and draw inferences. ð Systematic searching for and testing of new knowledge. ð Continuous improvement in new methods and technologies. ð Successful ongoing programmes to ensure a steady flow of new ideas, even if imported from outside the organization. ð Demonstration of organisational capabilities by introducing self-managing t teams and high level of worker autonomy. ð Companies must review their success and failures assess them systematically; and record lessons in a form that employees find open and accessible. ð Sometimes, the most powerful insights come from one's immediate outside environment. ð Even companies in completely different businesses can be fertile sources of ideas and catalysts for creative thinking. ð Best industry practices are to be uncovered, analysed, adopted, and implemented. ð The greatest benefits come from studying practices; the way work gets done rather than results. ð Knowledge must spread quickly and efficiently throughout the organisation. ð Make use of mechanisms such as written and oral communications, site visits and tours, personnel rotation programmes, education and training programmes for transferring knowledge. ð Transfer may be from .division to division, department to department, or facility to. facility; they may involve senior, middle, or first level managers. Some of the common operational practices of learning organisations dealing with people are openness, systematic thinking, creativity, awareness of personal and organisational values, empathy, aid sensitivity. 1. Personal Mastery: Creating an organisational environment, which encourages all its members to develop themselves toward goals and purposes, they choose. 2. Mental Models: Reflecting upon, continually clarifying, and improving internal pictures of the world,:. and seeing how they shape our actions and decisions. 3. Shared Vision: Building a sense of commitment in a group, by developing shared images of the future and guiding principles and practices. 4. Team Learning: Transforming conversational and collective thinking skills,- so that groups of people can reliably develop intelligence and ability greater than the sum of individual members' talents. 5. Systems Thinking: Thinking about; and a language for describing and understanding forces and interrelationships that shapes the behaviour of systems. Openness: The learning organisation has to be open to enquiry and tolerant of criticism and debate. Innovation: The learning organisation has an organic structure and culture which permits it to evolve rapidly. It liar a deep skill base and capacity to deal internally with complexity and uncertainty. There are three primary tasks toward developing the learning organisation. 1. First, leaders and managers must create opportunities for learning. 2. Second, they must foster desirable norms and behaviours. 3. Third, they must personally lead the process of discussion, raise questions, listen attentively, and provide feedback. Organisations learn only through individuals who learn. Individual learning does guarantee organisational learning, but without it no organisation learning occurs approach that needs to be taken is that learning must be continuous and integrate that employees understand and accept the need for change which finally results ii improved work culture. Learning organisations are not built overnight. It is a slow and steady process of cultivated attitudes, commitments, and management processes. Any company that wishes to become a learning organisation can begin by taking a few simple steps first step is to foster an environment that is conducive to learning. The second step is to open up boundaries and stimulate the exchange of ideas. The third step is to eliminate barriers that impede learning and assign learning a higher position in the organisational agenda. 1. Commitment to well-defined organisational priorities. 3. Mechanisms of collective thinking. 4. Flexible and participative leadership styles. 1. Culture of complacency arising from past successes. 3. Narrow definition of roles of organisational members in hierarchical organi leading to loss of creativity among employees. 4. Due to preoccupation with day-to-day fire fighting functions, less attention usually given to important issues of change and innovation.